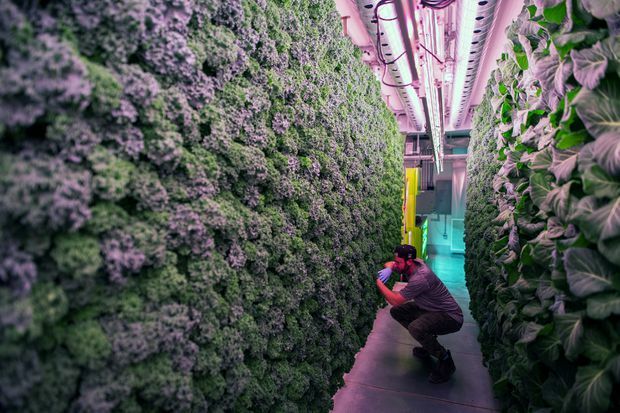 An employee inspects a wall of kale and greens growing vertically inside a modular farming unit at Modular Farms Co. headquarters in Brampton, Ont., on Aug. 11, 2017. Some harsh realities are driving investment. Rising world population means more mouths to feed, while the availability of arable land isn’t just capped, it’s shrinking as a result of development and changing climate patterns. Vertical indoor farming allows nutritious food to be grown where it’s needed, regardless of land availability or climate. It also reduces, sometimes dramatically, the amount of water and energy that goes into agriculture production. Frost calculated that about 22,000 vertical farming patents were filed globally between 2014 and 2016 alone. Allied Market Research, another research firm, estimates the market will grow at a compound annual rate of 23.6 per cent, to US$6.4-billion by 2023 from US$1.5-billion in 2016. All key operations can be remotely monitored, and the facility’s spacious layout makes for easy maintenance and harvesting. The company says this design allows a range of plants to be grown using 95 per cent less water and up to 30 per cent less energy than an outdoor soil-based farm with similar yields. Time will tell if the system delivers as promised, but after only a year on the market, more than 15 of these container farms have been sold, with dozens more in the sales pipeline. “We’ve been getting so much interest from people we never thought we’d be selling to initially,” Mr. Spiro says, explaining that urban and remote communities alike are drawn to the idea of growing their own food year-round. Schools, mining and logging operations, commercial caterers and food distributors are among the customers Modular Farms is now targeting. In September, for example, the company will deliver one of its farms to Dene High School in La Loche, Sask. The student-run farm will grow vegetables and fruit to support the school’s lunch program, and it will double as a classroom where students can learn about biology, nutrition and entrepreneurship.